How I built an app that made me $3.40 yesterday, and why that excites me. Yes the app only just launched and it’s not even 1000 users and figures are compared to a small (or non-existent) base, but the stone-cold truth is this: Real people are finding something that I built useful, and that’s what I set out to do. Here’s how things panned out. My lovely wife (and mother to my 5 (yes, f-i-v-e) children) came up with an idea to create handmade jewellery with lava beads for diffusing essential oils. After a lot of research and hard work, she has made Lava and Stone into a thriving business, one she crams into the limited amount of spare time she has between running a house with 5 kids and all that entails. She sells products via her website which integrates with with Facebook so people can also browse her products from the comfort of their Facebook app. Before long, opportunities arose for her to sell her products at local markets, and after attending a few, it became obvious that local markets were a big opportunity to sell lots of stock in a short period of time. But there was a challenge – accepting payments. Some people had cash but many wanted to pay via credit card, and when advised it was cash-only, while some made the trip to a nearby ATM, many others simply moved on. Now mobile payments are easy, right? Just get a card reader and do them on your phone, right? Well yes, and no. My wife’s business is linked to our family trust, and this type of business isn’t supported by the main provider(s) in this space, so we looked into other options and found a few mobile apps which looked like they might do the job. They hooked into Stripe (which is already being used to process transactions on the website, so that makes things easy) and allowed payments to be processed without the fiddly little card readers which was also a nice bonus. 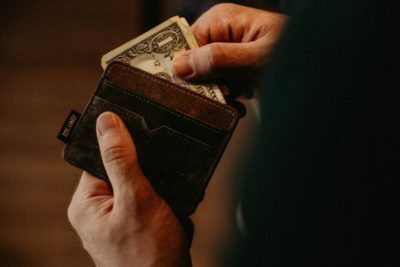 The downside was the sheer ugliness of the apps and the limited functionality, however for the core functionality of processing payments, they got the job done, and so away we went. For a small additional fee (~$0.20) on top of the standard Stripe fees, my wife was up and running and accepting credit card payments like a champ. And then things changed. The app of choice changed to a % model (which many others were already doing), so instead of paying an additional $0.20 per transaction, she would be paying a lot more (like 4x or 5x), while not receiving anything else in exchange. I had previously considered building an app for this purpose, but I had resisted the urge to do so given the existing options worked ok, until now. I wanted to build something that was not only fair (I thought a $0.20 fee was fair – much fairer than charging a % fee), but beautiful. And more functional. And easier to use. I went to work scoping out what can and can’t be done using the Stripe API and how I could make an app that people would find really useful. I didn’t want it to just accept payments, I wanted to allow people to keep track of how their sales are going, view past transactions, process refunds, see upcoming payouts and receive notifications so users can celebrate each time a new payment goes through. I wanted to do it all, but I also wanted it to be super-easy for people to use, so I engaged the services of superstar designer and Google Design Expert, Taylor Ling, to take my idea and make it look good. 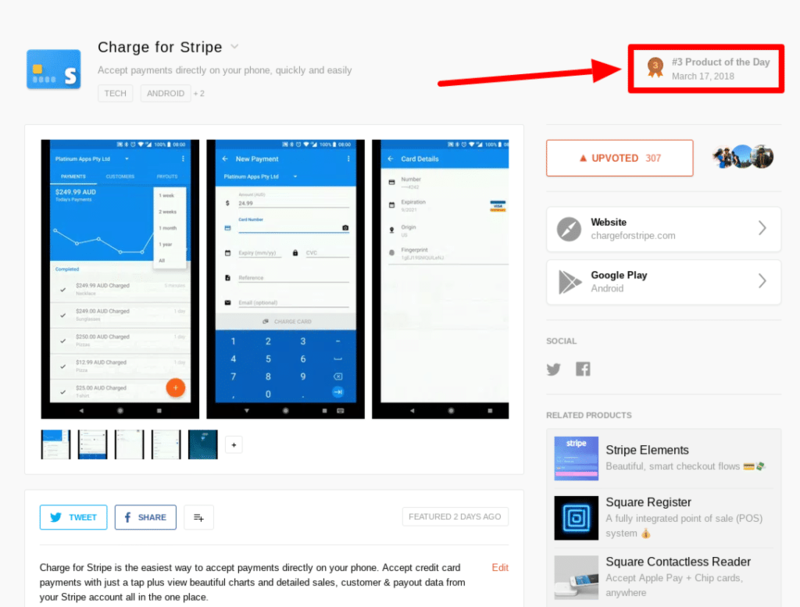 Fast forward about 10 months and Charge for Stripe was released on Google Play and launched on Product Hunt on March 17th, ending the day as the 3rd most upvoted product of the day. To say I was stoked is an understatement! The feedback was overwhelmingly positive and lots of people got in touch to share their appreciation and positive feedback, along with suggestions for how we could improve the app further. So here we are in May 2018 and people are actually using my app. Real people. It’s being used by tow-truck drivers, painters and beauty therapists, to sell jewellery at local markets, cars, spas, clothes, caring services and lots more, and I couldn’t be more pleased. I made $3.40 yesterday and tomorrow will (hopefully) be even better.